So, the plan has been in the making for months. Maybe even years. No matter how big, it never seems big enough. Now that I have returned to my furniture restoration/makeovers, I have taken over more of the space in my three car garage and we are back to the point of not having enough space for any cars! Not only is this just bugging the crap out of me, but it really means the investment in my cars is being dismissed. We’re smack dab in the middle of tornado season (along with hail and strong winds) and I hate to think about not being able to get the cars in the garage when I needed. 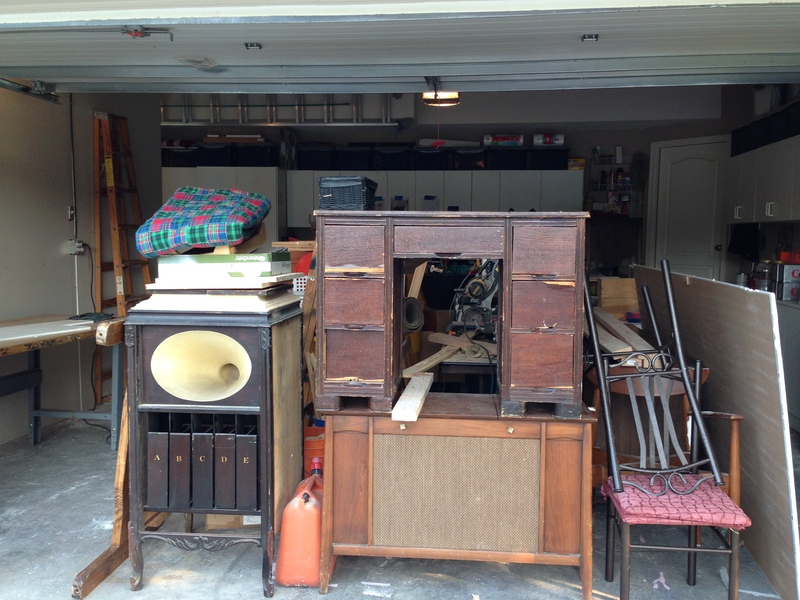 So… we’re doing a garage makeover. 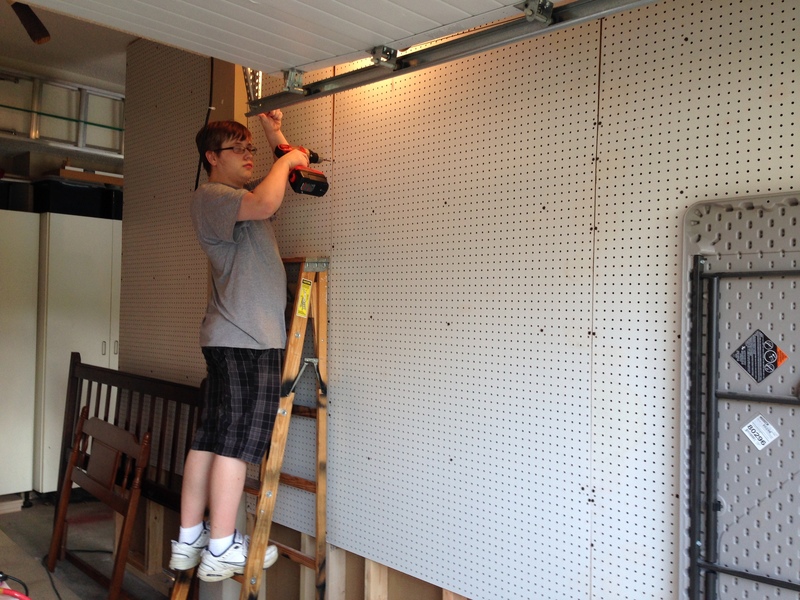 I am framing a wall between the second and third bays of the garage and utilizing the height for more storage. Besides, the uneven (not to mention ug-a-LEE) table that I have my power tools is definitely not the quality that I am used to. 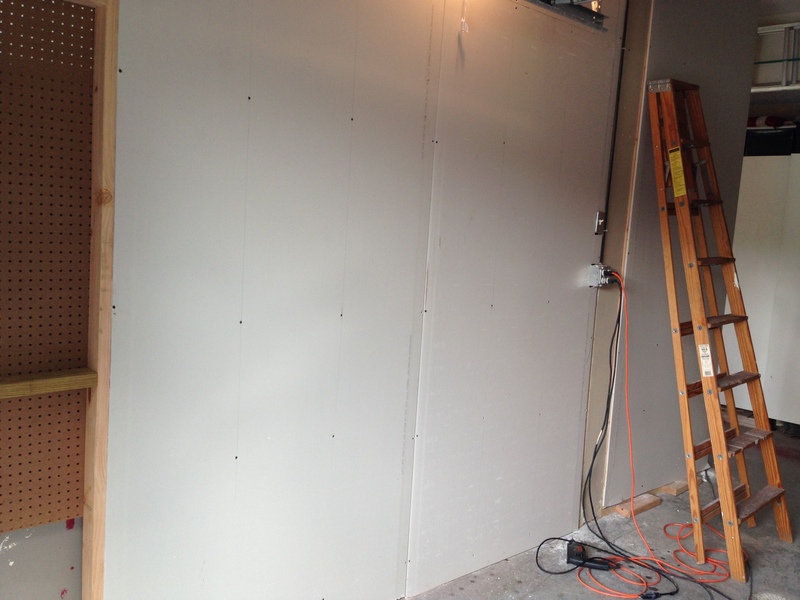 So, the wall is being sheet-rocked on one side and the other side has pegboard from floor-to-ten foot ceilings. Lots of things hanging and out of the way. It also means nothing to interfere with getting the car into that third bay when I need to. 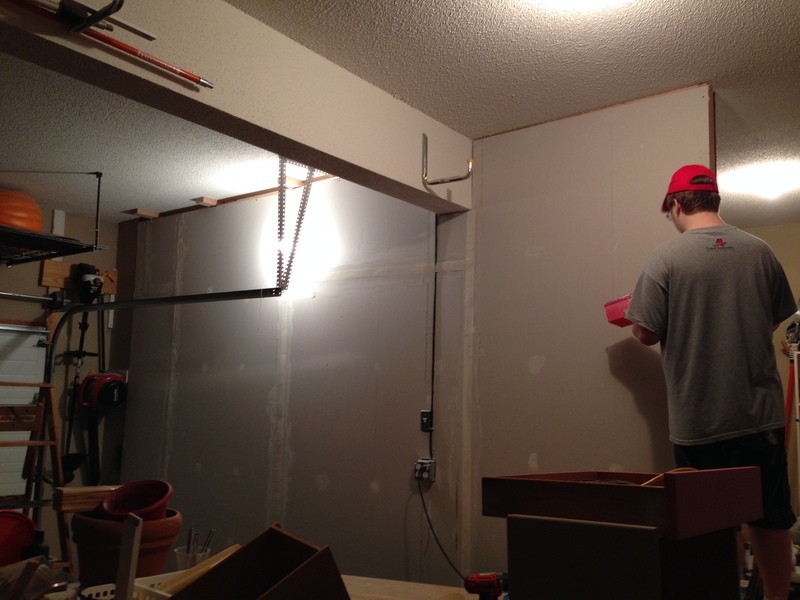 Me and The Kid (and even the old man himself) spent a couple of days building the stud wall and then me and the Kid did all the sheet rocking. It was fun learning how to do mudding and taping – we watched a YouTube video on how to do it. It is one of those things that is really great to have in your repertoire even if you never do it again. And it makes you appreciate those that do that job for a living… it isn’t easy! The mudding and taping was completed, even if not perfect. I opted with good enough and done, rather than perfect. The Kid went ahead and painted the wall, leftover paint from the original house colors and it looks good. I haven’t decided about the other side, the peg board is by default white and I think I can live with that. I’ve moved in some of the cabinets which used to sit side-by-side and now there are stacked. Ten feet of vertical storage only occupying about six square feet of garage floor. And it is white, like the other cabinetry that already exists in the garage. We did a California Closets setup when we first bought the house and I have loved, loved, LOVED all that storage. I found really nice cabinets on CraigsList for about $150 which will be perfect for the tools to sit on, although they are grey. But they are still very nice. We should be picking them up Saturday morning. This weekend is going to be very busy while we’re attempting to get this done. Picked up the cabinets this morning and spent the day cleaning, reorganizing and discarding the useless junk that seems to pile up when you’re not looking. Months ago, I picked up carpet squares from CraigsList, so I stripped the old, dirty and stained carpets that I had on the floor of the garage and laid out the carpet squares. Then it was time to move all the project pieces into the smaller side so that (hopefully) we can finish the large side tomorrow. My arms, knees and back are killing me and I really need a solid night’s sleep so that I can get right back into it tomorrow.